Star Fox, one of the greatest 3D space shooters ever developed, has a pretty decent fan base even after eighteen or so years. It had a sequel that was 99% complete, but it came very late in the Super Nintendo’s life and it was held off so that the next great Star Fox would be on the newest Nintendo console, the N64. You could get the Japanese version, which aside from a couple debug routines, is complete, and you could play it on an emulator. While emulators are fine for most of us, anyone who has played a game on the real metal can quickly and easily pick out minor nuances. 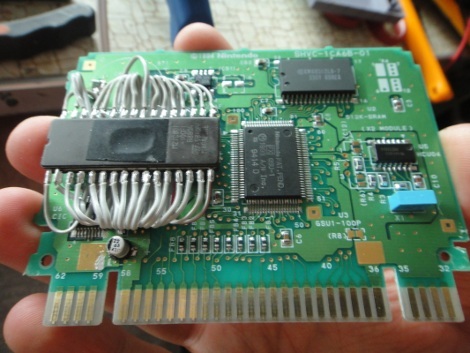 Since playing Star Fox 2 on the real hardware is not a simple trip to the flea market, [Doug] went about ripping apart an old SNES cart and placing a eprom inside with the data from the game. Through that 8 page forum post you can see the project start, progress through different constructions, and result in 3 fully working carts, complete with custom labels. Join us after the break for a quick video. If anyone cares, there’s a bounty for doing this with Wing Commander 2 for the SNES. You can talk to the site admins at http://www.wcnews.com for information, it’s a good community that is known for getting stuff done. Kudos for getting it to work on a real SNES. I was just thinking about how much I wanted to find the Star Fox 2 ROM and give it a play the other day…this is inspiring…and tempting. If it was never released then how can we legally obtain the rom? Not to be that guy, I am just curious is all. Also great work man, I am not all that much of a Star Fox fan, but a buddy of mine is, and I am sure he will be glad to see this. Yet again the modders at moddedbybacteria prove again that they are serious in the modding world. If you havent checked out there site….you would be amazed! Exactly, The poor company that made StarFox II is losing billions of dollars a second every time someone plays it! Why wont anyone think of these poor people! Oh wait, the arguments against Piracy on retro consoles dont stand up.. WE need to ignore that as we must protect the precious corporations! I think this should be a featured hack, pong clock has been there too long now. The damn BOX has been found, but not the code. it appears this hack was already done. good feat nonetheless, didn’t know about this game! I totally respect the hack, but being an SNES lover, I’m curious: is the tototek Super Flash cart any different? I was never too sure how the whole superFX chip thing worked with the super flash cart, I’m guessing it might not work. I dream of one day doing what tototek did and putting ram and an FPGA on an snes board with the superFX chip. It may have been better with a zif socket, to allow changing to different eproms without a bunch of soldering. Awesome, someone should try doing this with a socket connector for interchangeable chips and rewriting. Anyways, fantastic project. Here’s my question. I can do everything in this mod, including a clean chip install instead of a nest of wires, but the one thing I lack is the writer. Is it possible to find the rom already on a chip somewhere? ?